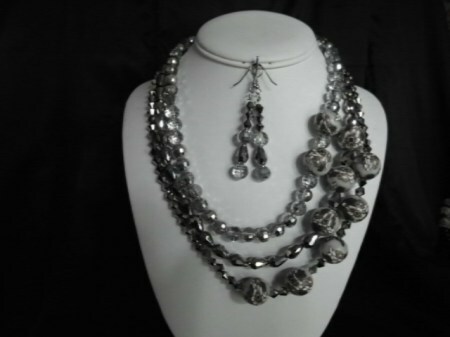 Three strand crystal necklace and earrings. A silver tube clasp holds three glamorous glittering unmatched strands of crystals; Swarovski 8mm silver half covered chessboard faceted, 10mm silver covered faceted teardrop, and 6mm silver covered bicone, with ten 16mm matte Fimo floral on gray background accent beads. 3" glamorous glittering earrings on french wires. Who needs a corsage?